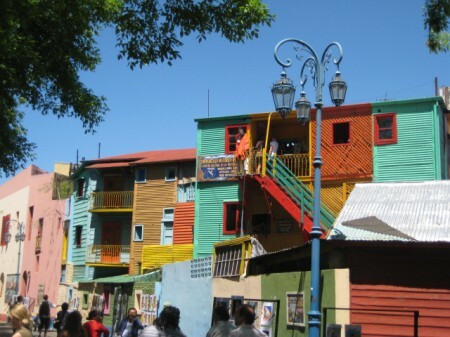 As a tourist, there are 2 reasons for visiting La Boca (the name, meaning The Mouth, refers to its situation at the mouth of the river Riachuelo), La Bombonera, home of Boca Juniors football team and El Caminito, a brightly painted tourist trap by the river. Being at the mouth of the river, La Boca grew from the shipyards and docks which clustered round it. When Italian immigrants arrived in Buenos Aires they often worked at the docks, and they lived where they worked. To this day the barrio remains a rough, proud and firmly working-class area. Boca Juniors football team is the pride of locals, and the letters CABJ (Club Atlético Boca Juniors) and the Blue & Gold colour scheme can be seen all over. Tours of the stadium (La Bombomera) are possible, but the only proper way to see it is to go to a game – contact me to find out more about packages to home fixtures. 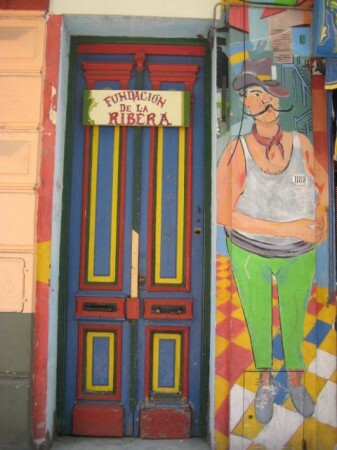 El Caminito is a must-see on any itinerary, but don’t think you’ll be seeing anything of the “real Buenos Aires”. The brightly coloured buildings against a deep-blue sky and models of famous Argentines (local boy Maradona being a particular favourite) waving from balconies make for nice pictures, but the rest of it is firmly in the tacky tourist trap category. Buses 29 & 64 from Plaza Italia are both a good way to get there. If you would like a private walking tour of La Boca & San Telmo, to understand the oft-ignored history behind these well-visited tourist sites, then please contact us through our custom private tours page.